Remember my post about chikankari, which is an Indian form of shadow work? Anita is teaching an online class and I signed up for it! 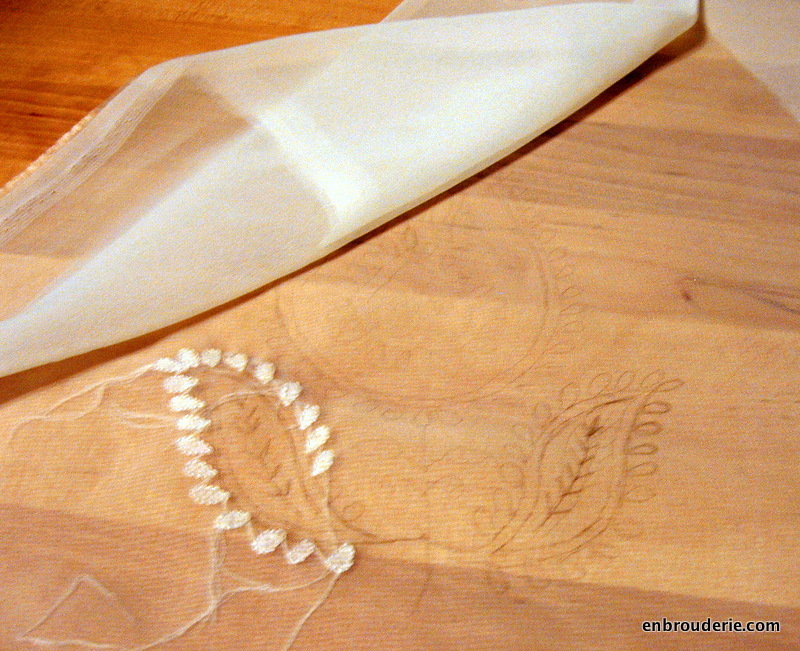 I picked out some ivory chiffon and some very pale variegated thread. It might be too pale for me, so perhaps I will mix it up with some colored threads too. This week we are working the double back stitch portion of the motif. I am having some difficulty photographing it – the light is bad because it’s pouring down rain, and the sheer fabric is messing with the camera focus. I will try again another day for better photos! In the meantime, these should give you some idea of what it looks like (though I do need to tuck the ends in). I am so excited! Thank you Anita!!!! This entry was posted in Indian embroidery, My work and tagged Chikan (embroidery), chikankari, embroidery, indian embroidery, Needlework. Bookmark the permalink. I can see it would have been horribly difficult to photograph, but it is already looking good! The shadow work looks so delicate and beautiful! 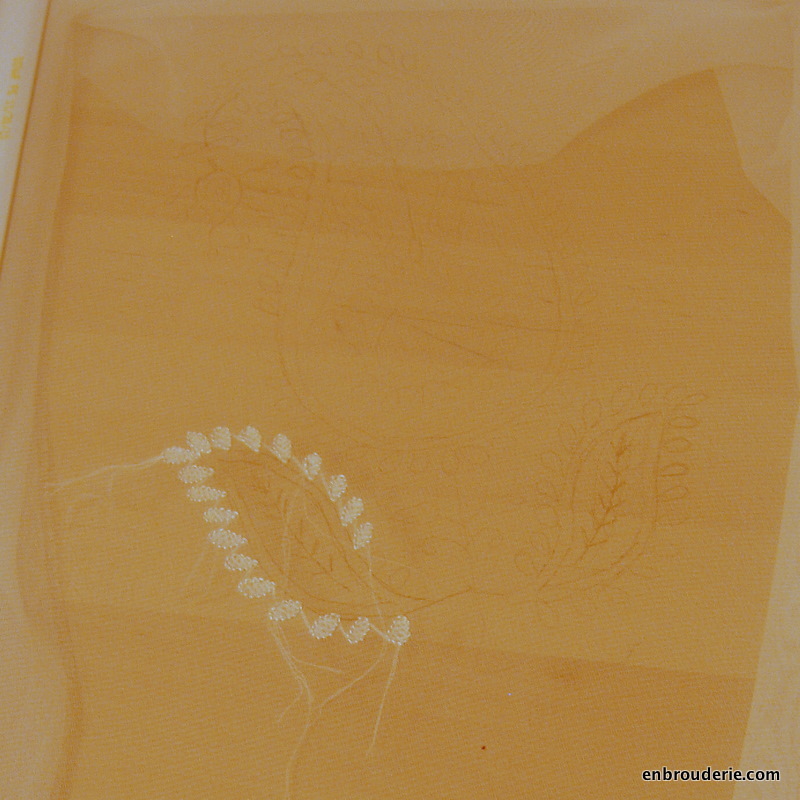 I do fine Dresden Lace type embroidery and tack the design onto the cotton muslin which is tedious, so I wondered what sort of marker you used and whether it washes out. I used a pencil. Whether it’ll wash out remains to be seen. It may be one of those lessons I learn the hard way. Thanks Hannah. I’ve used pencil too and found it worked well so long as I embroidered over the lines. I can’t wait to see the rest of the Chikan project. this type of embroidery is amazing!! so beautiful and delicate. I cannot wait to see the end result.